…but the decreases are ugly! …so i frogged it. being careful not to repeat a previous mistake, i washed and stretched the yarn after ripping and now it’s as good as new! i’ve left it alone for now, i need to ponder for a bit before i decide what to do with it next. try the same pattern, but differently? try another pattern? we’ll see, i’ll get back to you on that. what i have done, though, is revived two old projects! the first is the gosford park slipover. 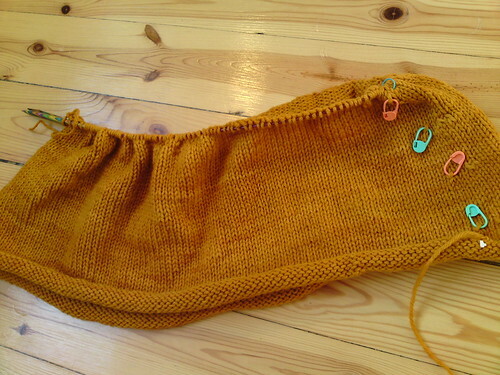 i’m knitting it in the round, with steeks, and i’ve actually made quite a lot of progress on it! 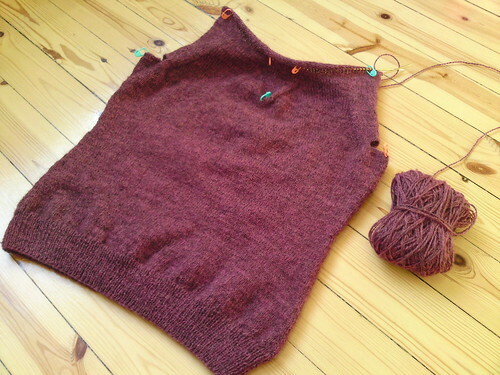 i hope it will turn out nice, the yarn is lovely to knit with and i’m growing more and more fond of that beautiful heathery colour. 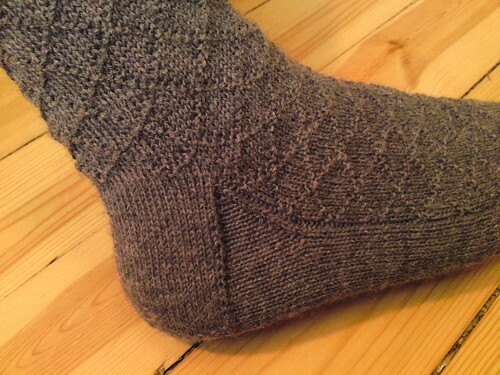 the other project is a pair of socks that i begun ages ago. 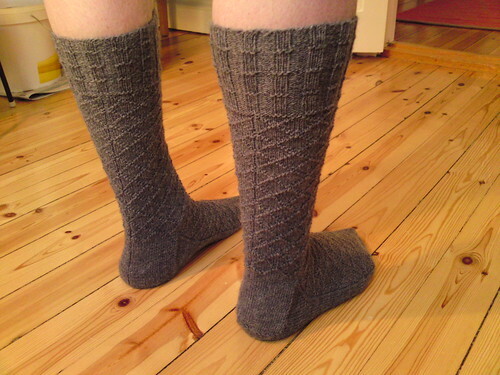 it’s the gentleman’s lozenge socks by nancy bush published in knitting vintage socks. 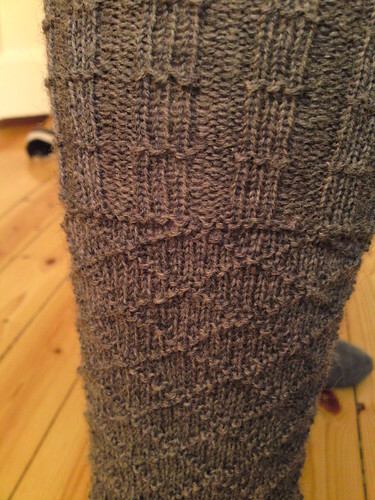 i’d used 2 mm needles and although the yarn is lovely at the tension that gives, the socks actually turnes out to be too tight. so i frogged the one i had started and re-cast on with 2,5 mm dpns instead. 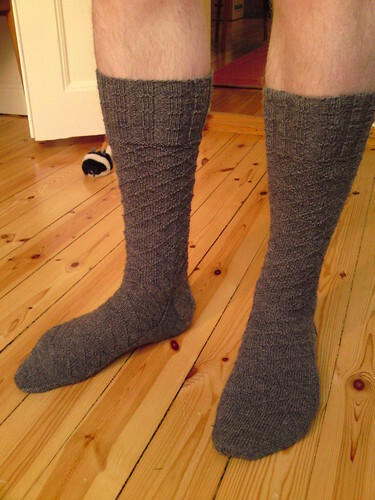 i didn’t wash and stretch the yarn, but i’m fairly confident it will be alright, it’s only socks anyway. 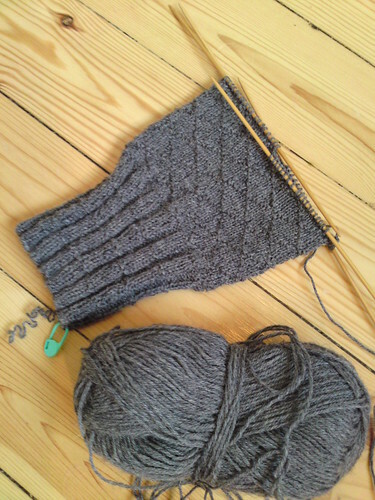 my cecily scarf is also coming along, i bring it with me wherever i go and whenever i have a few minutes to spare, i work a few rows.